Few experiences are more beloved than motherhood, yet the role can be very lonely. There are no headlines applauding the accomplishment of getting all the kids to bed. No one sees the gargantuan effort it takes to seal the lips when all you really want to do is snap. Mothers battle monotony and insecurity, fear and guilt - and they often do so alone. A Mother's Musings breaks that loneliness. In this beautifully-written book author and columnist Bassi Gruen allows us into her inner world as a mother. With eloquence and honesty she shares the struggles and the joys, the hopes and the doubts. We stand with her as her baby moves into his own room, we see her deal with the toddler in the throes of a tantrum, we join her as her daughter makes her very first kugel. In addition, selections of fiction are woven throughout the book, the stories of other women who could have been. Bassi gives a peek at two levels of her life; the events as they occurred and the inner changes they stirred - the perspectives shifted, lessons learned, the resolves undertaken. This is a book about growth and transformation, about how little people can trigger big changes. The stories are hers - but in them you will find yourself, your mother, your neighbor, your friend. 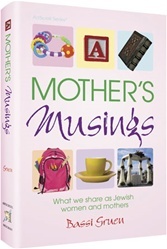 For they are the stories of all Jewish mothers.